Our glowing professional ballerinas light up the room in our bespoke LED tutu's! These are classically trained ballerinas with a special technique in classical ballet and Pointe work. They are the pioneers of ballerinas for events with a wealth of experience throughout Europe. The ballerinas create fully costumed small and large scale ballet performances. All choreographed pieces are carefully designed and beautifully costumed, to add a touch of glamour and magic to every performance. With a love of the classics but also a passion for creating new works, they can perform either excerpt from timeless classical ballet productions, such as "Swan Lake" and "Sleeping Beauty" or create bespoke performances which are specially created for your event. All choreographed pieces are carefully designed and beautifully costumed, to add a touch of glamour and magic to every performance. 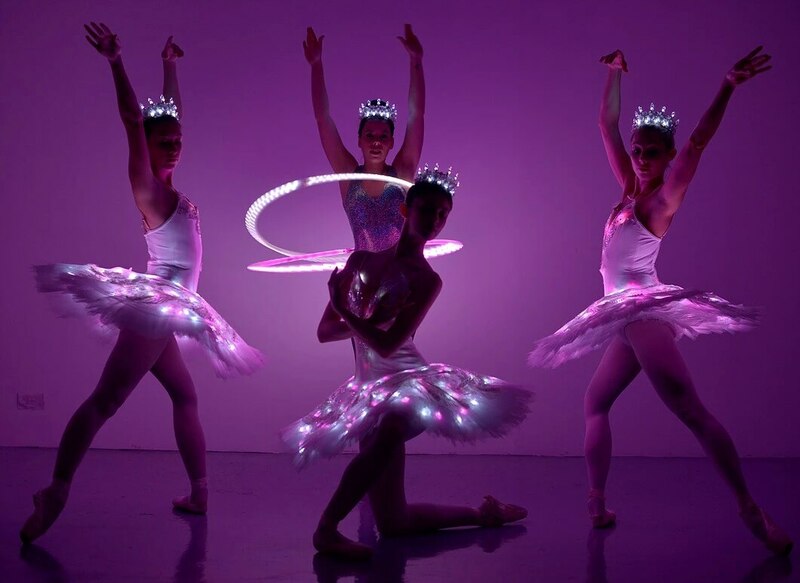 What do you get when LED Hula Hoopers and LED up ballerinas join forces? The girliest LED spectacular show of all time! These gorgeous Ballerinas and the hugely talented majorette Hula Hooper’s have choreographed a LED Girl Power show to knock you sideways! So if you are looking for a truly jaw-dropping act to bring something totally unique to your event and wow your guests then look no further than this show. That’s right Spice Girls eat your heart out! From full stage shows to ambient sets and meet and greet they’d love to perform and entertain your guests! Our LED ballerinas and violinists absolutely love performing the stunning Swan Lake. The most popular of all performances, this long standing classic is performed to the wonderful Tchaikovsky score. The choreography has been adapted to fit the stage floors of London's top venues. Our dancers have performed this excerpt at beautiful establishments such as Guildhall, Grosvenor House and Royal Hospital Chelsea. Our corps de ballet of Cygnets float seamlessly through the room to be joined on the dance floor by our Principle Swan Princess and Prince pas de deux duet who always stun and thrill our audiences. With amazing purple and green beams flying out of our ballerina's fingers, we create a magical show of light and colour. Paired with our beautiful LED tutu's in either white, pink or purple and our white LED tiaras this is a spectacle to behold. Performed to the wonderful track 'Young and Beautiful' by Lana Del Ray, this performance is absolutely show stopping! This sparkling Masquerade act is perfect for glamorous evenings full of drama and opulence. Our professionally trained ballerinas will thrill your guests with classical choreography performed to the wonderful 'masquerade suite' by Khachaturian. With sparkling white masks and beautiful tutu's, our ballerinas bring a touch of magic to your masquerade event. Perfect for traditional British themed events. Our ballerinas can light up red, white and blue and perform to the fantastic Pomp and Circumstance March. This act loves to be paired with Royal Marching bands and the best of the best of British music. With classical white tutu's and striking GB flags, we'll add the final touch of magic to your big event.